Highland brewery’s Orkney Blast is named CAMRA’s Champion Beer of Scotland 2010. 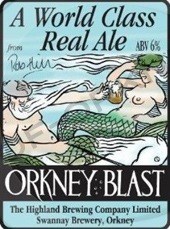 The Campaign for Real Ale (CAMRA), has announced that Orkney Blast produced at the Highland brewery of Birsay, has been crowned ‘Champion Beer of Scotland’ for 2010 at the Scottish Real Ale Festival. Highland brewery’s success at the Festival is the culmination of months of CAMRA branch recommendations and tasting sessions in the quest to find the best beer in Scotland! Runner up in this year’s competition was the Black Isle brewery’s (of Munlochy, Ross-shire) Hibernator Oatmeal Stout, while third place went to the Cairngorm brewery’s (of Aviemore, Highlands) Black Gold. Judging the final entrants this year were a panel of CAMRA members, brewers and beer writers. Black Isle Brewery, Save the planet, drink organic. Cairngorm Brewery Co, Good things brewing in the Highlands.